Here at Ironmongery Experts, we have a strong selection of Cabin Hooks, ideal for securing gardening equipment or locking gates. Our designs are both practical and stylish, ensuring the optimum long lasting quality you desire. Any outside appliance or piece of furniture can be accessed with ease and securely locked away when not being used. All our Cabin Hooks are made with high quality materials like Zinc and Steel to emanate a classy finish. 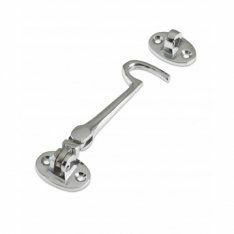 Check out the 102mm Polished Brass Cabin Hook or the 150mm Bright Zin Plated Wire Eye Cabin Hook and Eye to see to level of high quality products we have on offer. We also have Magnetic Catches for an even more strong method to secure both domestic and commercial appliances. The design means all structures are closed to its maximum potential with a focus on strength. Any home or workplace will look clean and tidy at all times and ensure you’re always leaving a good and positive impression. Good Ventilation is also key for a productive and clean working or home environment. We have a selection of sleek and stylish products that will ventilate and cleanse rooms with ease whilst also adding a classy tone to your establishments. For a fun and exciting way to open and close your doors and drawers, check out our range of dynamic Cupboard Knobs and Handles. These are sure to be a huge hit with the kids, especially our Cebi Joy Pip Character Cabinet Knob design. So, add vibrancy and style to any of your appliances or hardware with any of these high-quality products. Maintain a tidy and well-kept household with any of our Hooks. Coats and jumpers need to be organised and stored in an easy and practical way, with our selection being the perfect way to keep rooms tidy.